« Like No Udder Meets Fully Rooted: Vegan Kombucha Floats & Scoops! Six years ago, we began our company with a household juicer and a vision to help others. 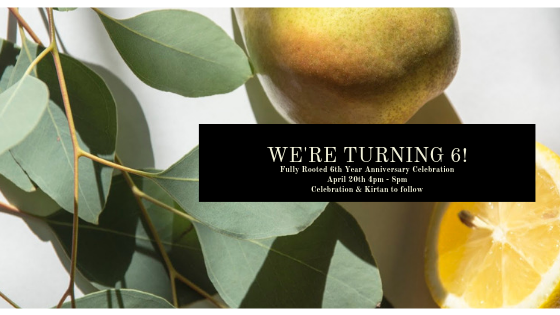 We proudly celebrate six years of providing nourishing juices and goods to our community. We want to share our gratitude with you by opening our doors, offering light fare and refreshments and the opportunity to bring positive vibes and best wishes to many more years of success. Mingle with Fully Rooted family and friends! Light fare, conversation and Juice & Kombucha from the tap will be flowing from 4:00pm to 5:30pm. No sign-up required, but please RSVP on event page! There is a small parking lot on the side of our building, please park at your discretion and leave lot by 8:30pm. Celebration led by Judy McClain & Friends. SIGN UP AT CURRENT STATE ONLINE, LINK BELOW. (Must Reserve a Spot). LIMITED SPACE FOR KIRTAN. Free Event. Six years ago our very first event was at a Kirtan hosted by Grace School of Yoga. We shared our passion for wellness with Grace’s community and we were inspired to continue on. Come full circle with us for an evening with Judy McClain & friends, former owner of Grace School of Yoga. Judy will lead yet again a Kirtan, or yogic chanting, in honor of our community, joy and continued success in all of our lives. A Kirtan is an ancient practice of yogic chanting, meant to still the mind by repeating mantras or words. A Kirtan is known to be powerful for heart-opening and a gateway to inner peace. It is led by a chant leader and includes instrumentals who guide the mantras or words while the other members in the room repeat the words. This practice allows us to connect to the divinity within.